Zaun and Parra? Is that you? Jake Taylor = Greg Zaun - This one is too easy. Over the hill catcher is brought back for one more go round. If he drops an RBI bunt down after calling a shot over the left field fence, I'll pay Rene Russo myself to show up at Miller Park with a newly-bare ring finger. Jeff Suppan = Eddie Harris - Soup might actually benefit from Harris's secret snot-ball, and after the past four years, isn't it fun to imagine him taking a flying bat to the head? Ryan Braun = Roger Dorn - On the surface there's no comparison in terms of age, position, and quality of player, but when you consider Dorn's obsession with marketability and outside business ventures, you'll see it. Alcides Escobar = Willie Mays Hayes - Escobar, with his sub-.250 BA and sub-.300 OBP, has incredibly frustrating for such a speedy guy, thus calling to mind this gem of a quote from the movie: "You may run like Mays but you hit like sh*t."
Ken Macha = Lou Brown - Well, to be honest, this one doesn't work all that well, and you should be glad. If the players walked in and found a cutout of Mark Attanasio with removable pieces of removable cardboard clothing pasted onto his body to be removed after a win, you can bet your life you're looking at a 100 loss season. 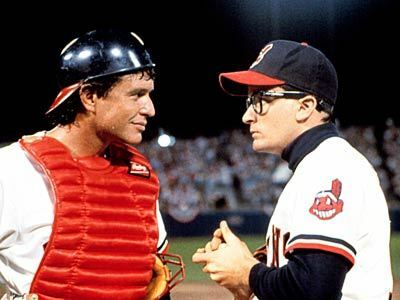 Manny Parra = Rick "Wild Thing" Vaughn - An emotional loose cannon with great stuff who is horribly inconsistent. Someone get him a pair of thick black-framed glasses and I'd be happy to sing that horrible song when he warms up. Prince Fielder = Pedro Cerrano - Big men who strike out a lot and play with a LOT of intensity. The intimidation factor is definitely there, but when you try to imagine Prince wanting to sacrifice a tofurkey before a big game, things fall apart. It just doesn't have the same oomph. Albert Pujols = Haywood - The player who beats the living tar out of the ball on a regular basis and is hated by the home crowd. I desperately wanted this to be that meat head Carlos Zambrano, but 1) he's a pitcher (though so was Pete Vuckovich, but that's beside the point) and 2) he's terrible this year. So Poo-Holes it is. Bob Uecker = Harry Doyle - The one and only. There is a slight problem, however--he hasn't been calling the games lately, which quite frankly has made this recent slide all the worse for those of us without cable. But here's hoping he returns quickly, healthy, and brings with him a pennant run much like the one the Cleveland Indians made in that classic movie. Seriously, how great would it be to hear Uecker scream over the airwaves, "The Brewers win it! The Brewers win it! Oh my God, the Brewers win it!" after Manny Parra strikes out Pujols in the top of the 9th and Zaun drops down a bunt to score Escobar in the bottom as the Brewers beat the Cardinals in a one game playoff at the end of the season?